In a Wall Street Journal Op-Ed (why do I read these!? ), Harvard economist Robert Barro claims that “according to [his] calculations” without extended unemployment benefits the unemploymnet rate would now be 6.8%. What are these calculations? Glad you asked! See? If you assume that long-term unemployment is caused by extended unemployment insurance benefits, then removing unemployment insurance extensions solves the problem of long-term unemployment (and you get a pony!). This must be why he makes the big bucks. Magical thinking. Suppose we make a different assumption. Let’s assume that changes in consumer demand have an effect on the level of employment. If so, then the decision to not extend unemployment benefits would reduce demand for goods and services. Where will the jobs come from? Businesses are not going to expand their capacity or their workforce in the face of falling demand for their products. The only way that extending unemployment benefits could actually increase the unemployment rate above what it would otherwise be (other than just assuming it will, as Barro does) is to assume that the people receiving those benefits, rather than spending them on food and rent, use the checks to set fires to businesses that are currently employing people. This assumption has the advantage of actually leading to the conclusion that Barro reaches, without magic. After its last meeting, the Federal Open Market Committee, which makes decisions about Federal Reserve monetary policy, decided to keep its holdings of long-term securities constant. The Fed was forced to look again at this issue because borrowers have been paying off the long-term debt securities already in its portfolio. This maturing debt consists mostly of Treasury bonds, mortgage-backed securities, and Fannie Mae and Freddie Mac bonds, most of which were acquired quite recently. 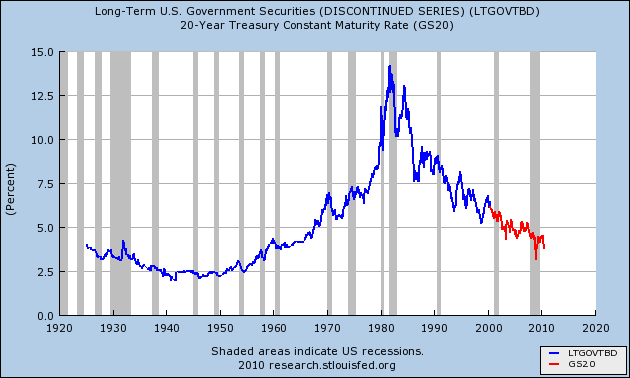 The Fed will reinvest the repayments in more long-term Treasury bonds instead of allowing its balance sheet to shrink. ….changes in the net supply of an asset available to investors affect its yield and those of broadly similar assets. Thus, our purchases of Treasury, agency debt, and agency MBS [mortgage-backed securities] likely both reduced the yields on those securities and also pushed investors into holding other assets with similar characteristics, such as credit risk and duration. For example, some investors who sold MBS to the Fed may have replaced them in their portfolios with longer-term, high-quality corporate bonds, depressing the yields on those assets as well. The figure depicts two data series maintained by the Federal Reserve, which I have had to splice together because neither series covers the entire time period shown in the graph, January 1925 to July 2010. It shows that throughout World War II and until 1953, the Fed kept long-term interest rates below 3 percent, which helped keep the cost of federal debt low. 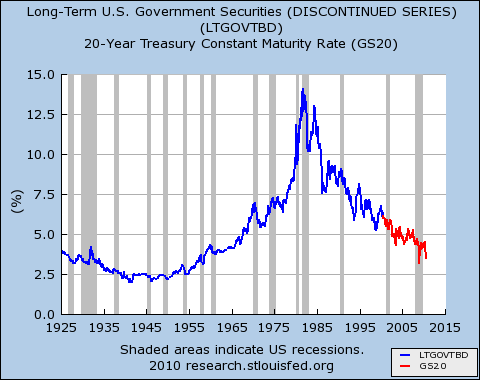 Of course, to do this, the Fed had to purchase many long-term government bonds. We wonder what will happen next. 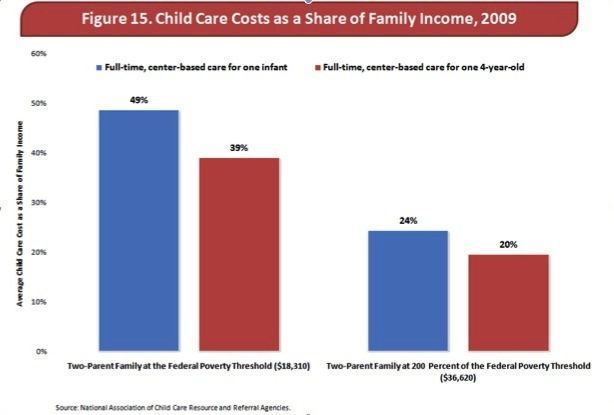 How costly is child care? You may already know that women’s workforce participation has increased and gender wage gaps have been closing gradually, although we still have a long way to go. Work-life balance can be costly, and raising children is rewarding yet financially challenging. A new report by the congressional Joint Economic Committee gives an excellent description on the status of women and challenges they have faced in the labor market over the last 25 years (ht to Catherine Rampell at Economix). The opportunity cost of being a stay-at-home mom is high and grows as time goes by at the rate of 1.34 percent a year! 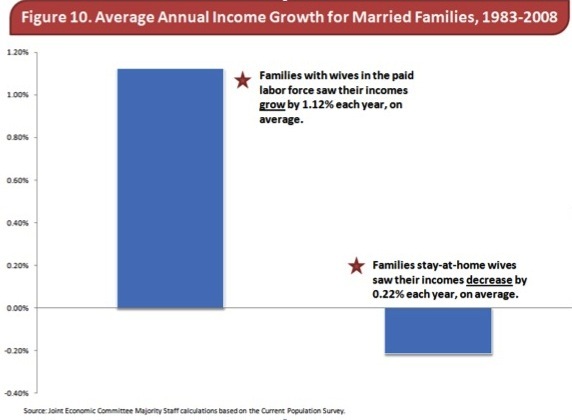 Imagine how much worse off the family will be in 30 years with all the forgone income, savings, and smaller social security checks to receive after retirement, and so on. Some of you may claim that it was their deliberate choice to stay at home, so the society should not come to the rescue. Well, if Paris Hilton becomes mom and decide to stay at home to take care of her kids, she probable won’t need any social support other than occasional photo-shoot opportunities to upkeep her celebrity status. For most of us with less financial freedom than Ms. Hilton, however, the choice may have been in part forced by lack of affordable quality care. Looking at the costs as a share of family income, I wonder: how in the world can a mom can keep her job and send her kids to day-care, unless society provides support? Having kids appears to be one of the traps of poverty! To address the inequalities of care burden, one solution is to expand social care provision and make it universal, if possible (universal care does not mean one is forced to join the system by law). It will not only free many, many women from the costly choice and burden, but offer jobs to many of them in the care economy, as my colleagues and I have proposed. Given the apocalyptic rhetoric we’re hearing, once again, about Social Security finances, it comes as something of a shock—even to me—to look at the actual projections in the latest Trustees’ Report. OASDI [ed. : in plain English, Social Security spending] is projected to rise from 4.8 percent of GDP now to about 6 percent of GDP in 2030, and level off. That’s not trivial—but it’s not huge either. Hence, the intermediate forecast reported by Krugman seems to indicate that we can maintain current benefit levels, retirement ages, and other rules for the foreseeable future using existing payroll and benefit taxes plus only a modest increase in federal revenues dedicated to Social Security programs. Perhaps more Americans will be able to retire fairly comfortably and at a reasonable age than some have predicted. Coincidentally, not long after the report was released, a new exhibit marking the 75th anniversary of the signing of the Social Security Act opened here in the Hudson Valley, not far from the Levy Institute, at the Franklin D. Roosevelt Presidential Library and Museum. (The famous Roosevelt home is on the same site.) I hope to see the Social Security exhibit soon and may report back to you on what I find there. It’s important to recognize that at the root of the financial crisis there was one of the greatest swindles of all economic history. The mortgages that were originated in the private sector in the United States which were then transformed into securities and sold through the financial markets around the world were in effect counterfeits. They were documents that looked like mortgages but were known by the people making them to be certain to fail. Children are among the groups deeply affected by recessions. For example, a government report issued last November found that over one million children sometimes went hungry in 2008, which represented a large increase over the previous year. Also, in a recent article, Katherine Newman and David Pedulla discuss how this recession has had an uneven impact, hitting groups like young people just entering the labor force especially hard. Programs that helped the poor in times like these were weakened greatly in 1996, when President Bill Clinton somewhat reluctantly signed a welfare reform bill that was not what he had hoped for, saying that it was the country’s “last best chance” for reform. The Personal Responsibility and Work Opportunity Reconciliation Act set time limits for receiving welfare benefits, and converted the program from one that provided grants to all qualified families to one that came in the form of a grant of a fixed amount to each state. In passing the bill, leaders intended to expand work requirements for welfare benefits, but in practice many were not able to get work, appropriate training, and/or child care. The bill followed many years of reforms at the state and federal levels, some of which had enabled welfare recipients to obtain job training or to raise their incomes substantially by putting in more hours of work. The idea is to show how poverty for this group is related to the strength of the job market. 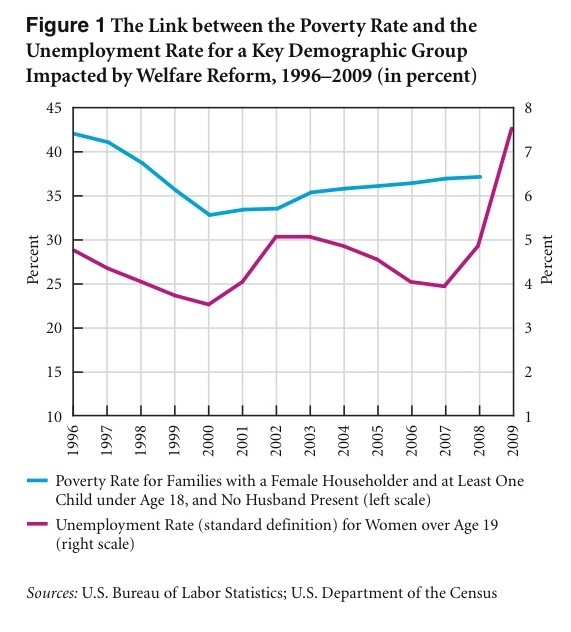 Note that as welfare reform went into effect in the late 1990s, the unemployment rate for women was falling, mostly because of a booming economy. This trend helps to explain the fall in the poverty rate shown on the left side of the figure. Then, after the stock-market crash of 2000 and the recession that followed, the unemployment rate shown in the figure rose. It dropped a bit during the subsequent recovery, but then climbed again, reaching 4.9 percent in 2008. This reduction in demand for workers partially explains the steady rise in poverty that occurred during the same period, to more than 37 percent in 2008. Fortunately, improvements in the earned income tax credit (EITC) program probably helped to contain increases in poverty rates during this period. Of course many other factors affect poverty rates, some related to the business cycle and some not. Unfortunately, as the graph shows, the unemployment rate for women more than 19 years of age rose again in 2009, by 2.6 percentage points—a big increase. The Census Bureau has not released poverty rates for that year, but this analysis shows that there is very good reason to believe that the new data will show that the rise in most poverty rates continued in 2009. Moreover, monthly data for this year show that the unemployment rate for women over 19 continued to rise in 2010 and stood at 7.9 percent as of June. Last month’s employment data will be released later this week. This information suggests that job creation efforts and other initiatives to help the unemployed and underemployed should be on the increase and not on the wane. The first is the idea that we need another “stimulus package.” How I hate that phrase! The message it conveys—of something fast, temporary, quickly withdrawn—is wrong. We’re not in an ordinary postwar recession. We’ve suffered a major collapse of the financial system. Repairing this, and working off household debt loads and the housing glut, will take years. Yes, the economy can recover without strong private credit, but the recovery will be slow and unemployment will not be cured. Hogwash, says Galbraith, who advocates freeing up jobs by making it easier for older workers to retire. You can read the rest here. Why not use government policy to directly create jobs — labor-intensive service jobs in fields like education, public health and safety, urban infrastructure maintenance, youth programs, elder care, conservation, arts and letters, and scientific research? Big new programs to create jobs need not be expensive. Suppose the cost of hiring a single employee were as high as $30,000 a year, several times typical AmeriCorps living allowances. Hiring a million people would cost $30 billion a year. That’s only 4 percent of the entire federal stimulus program, and 0.2 percent of the national debt. You can read more on this blog about the ideas of Levy scholars along these lines, or you can cut to the chase and read a Levy Policy Brief on this very subject for yourself. Another related Levy publication, this one a Policy Note on job creation and the lessons of the New Deal, is available here.